Preferred Habitat: Redbreast prefer the clear flowing streams of North Carolinas sandhill and coastal plains. They prefer deeper waters especially those with rock and gravel bottoms, logs, aquatic vegetation or other submergent cover. Range: Redbreast are found statewide, even in the smallest foothill streams. However, they are most productive in Coastal plain streams. Common Size: In the Piedmont section of North Carolina, the average size is 3-5 inches, while in the coastal plain the average size would be 6-8 inches. Food Habits: Redbreast feed predominately on aquatic insects, terrestrial insects, other invertebrates and occasionally fish. 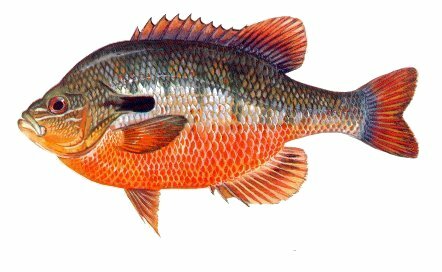 Redbreast are better adapted, than other sunfish , to utilizing food organisms produced in flowing water habitat. Spawning: Redbreast spawning activity occurs during May and June when water temperatures exceed 65° F and approach 75° F. The redbreast found in streams will build nests on the downstream side of stumps, logs and other obstructions. These protected areas reduce the amount of energy necessary for the redbreast to remain on the nest. Females will deposit between 1,000 and 10,000 eggs at the nest site where the male will fertilize and remain to guard the eggs until the young fish have developed and dispersed. Nest sites are usually chosen over sand or gravel substrates to protect the eggs from siltation. Redbreast can and do spawn in impounded waters, however, growth and reproduction is best suited in flowing waters. Miscellaneous: Historically, redbreast sunfish have been the most important sport fish in blackwater coastal streams. Due to unauthorized spread of flathead catfish, their numbers have been severely reduced. It is believed that because they spawn in the mainstream channel, flathead catfish can easily prey on spawning adults. When redbreast numbers are reduced, bluegill and redear numbers increase because spawners bed away from the main channel and remain relatively isolated from flathead predation.